I'm a huge fan of Wacom's multitouch and pressure-sensitive tablets, and it thrilled me to see the company taking its first foray into building its own tablet computers, the Cintiq Companion and Cintiq Companion Hybrid. For years, Wacom has licensed its technology to Windows laptop manufacturers; to see the company selling its own computer hardware is an exciting step. The Companion line comes in two flavors: the $2000-$2500 Windows 8 Cintiq Companion, and the $1500-$1600 Android-powered Cintiq Companion Hybrid. 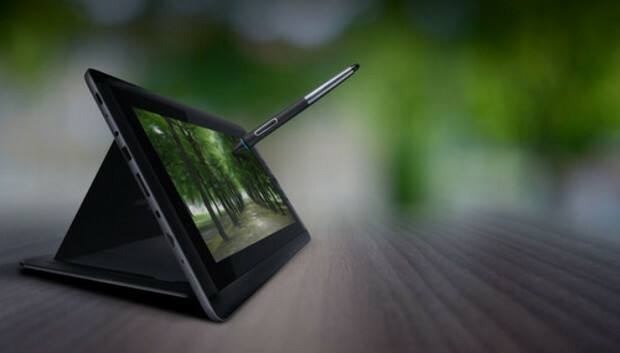 Both models offer you the full functionality of a Cintiq display, letting you hook it up and use it as a pressure-sensitive second monitor with your computer--but in addition, when it's not connected, you can use the tablet as either a Windows 8 machine or an Android device. I've had the good fortune to extensively test Wacom's Cintiq Companion Hybrid for the last month or so, and while I've found several things to like about the device, they're mostly in the Cintiq's native realm--the desktop. Sadly, the portable Android experience is far less satisfactory. Despite now being a year old, Android 4.2 Jelly Bean is serviceable enough on the Hybrid, and Wacom's pressure-sensitivity integration into apps like SketchBook Pro makes it easy enough to dive into a drawing or a sketch. But the actual management of these sketchbooks--and sending them off to your computer--proved much more difficult. On a Mac, the Companion Hybrid needs Wacom's traditional driver software to function as a display tablet, but it also requires Android File Transfer for moving documents back and forth. The software isn't functionally that bad, but third party apps on the Hybrid occasionally have trouble saving to a place that's easily accessible via Android File Transfer. I eventually got around it by using Dropbox for those apps, but that may not be ideal. Apart from the file system shenanigans, Jelly Bean does run rather smoothly on the Hybrid. Battery life was about as long as indicated (around a day's consistent use). In addition, programs open quickly, there's no noticeable lag while drawing, and the actual pressure-sensitive integration in third-party apps is excellent. Occasionally, I'd see a stuttering scroll or a lag in open time, but by and large Jelly Bean works pretty well with the hardware as an Android tablet alone. It does seem comically large at times--the keyboard looks much like the iPhone keyboard on an iPad, jumbo-sized for the Hybrid's 13.3-inch display. That might be my chief complaint about the Cintiq Companion Hybrid--it feels just a little too large when you're lugging it around and sketching on the go. Bezel included, the tablet is the width and length of a 10x15-inch sketchpad (approximately the size of my 15-inch MacBook Pro), and it weighs 3.6 pounds. As a desktop Cintiq, it's just the right size--the 13.3-inch screen is large enough to work on a canvas without feeling cramped. But I loathed taking the Cintiq out to my local coffeeshop--I had to bring a proper backpack to carry it anywhere, and once there, it's awfully cumbersome for sketching quick notes or ideas. Once you've got the Hybrid connected to your computer for use as a Cintiq, it works flawlessly. But getting it initially connected on a Mac can be a bit of a hassle. Like the 13HD, the Hybrid uses the 3-in-1 dock connector setup to hook up to your Mac. (Yes, you have to connect it to power to use it as a Cintiq--you won't be able to wirelessly use your tablet as a monitor.) In addition to the power cable, you need a free USB plug, as well as an HDMI port. "But wait," you say. "The only Mac that has an HDMI port is the Mac mini." And you'd be right. In order to use the Hybrid with most any current Mac, you'll need an HDMI to Mini DisplayPort (or Thunderbolt) adapter. Otherwise, you won't be able to use the tablet on your computer. It seems a shame to stick the Hybrid with HDMI given the many interested parties in the Mac community who might want to purchase the tablet; unfortunately, if you want native connections, you'll have to first consider the higher-end Cintiq Companion, which connects via Mini DisplayPort. In addition, Wacom's Desktop Center software is, sadly, another black mark in the company's software design history. This may be in part because it was dually targeted to both OS X and Windows, but it's still a shame. Some buttons in the software either don't work or their touch targets are incredibly small, while other sections lead to 404s on the Wacom website. Though I didn't get a chance to play with the Hybrid's high-end sibling, the Cintiq Companion, I almost wish I had--though it has relatively the same footprint as the Hybrid, it runs Windows 8 (and Photoshop in full!) and can store up to 512GB of data. The Hybrid, in comparison, can store a maximum of 32GB. I can see the size of the tablet being fine if it's also your primary computer, as the Companion is designed to be. But to carry it along with a laptop or to use it simply as a "second screen" device, as the Hybrid dictates, seems a little unwieldy. In the end, I think that for the same price as the Hybrid, I'd much rather pick up the $1000 Cintiq 13HD display and an $499 iPad Air for on-the-go-work. Wacom's pressure-sensitive technology is amazing, but if the Hybrid doesn't fit your portable workflow, you may find yourself never using it outside of the desktop environs. As a Cintiq tablet, Wacom's new Cintiq Companion Hybrid is everything I love about the company's line of multitouch pressure-sensitive displays. It's sleek, easy to sketch on, and brings Wacom's signature pressure-sensitive drawing options to your computer. As an Android tablet, though, it feels like too much. Its connecting Mac software suffers from clunky bugs and bad touch targets. And it's not quite portable enough to be the perfect desktop/laptop hybrid. For those who like working with Android and don't mind the bulk, the Hybrid may be exactly what you're looking for. But those who rely on smaller, iPad-like gadgets for the road may be disappointed.